Master of Ceremony - Mr. Athanasios Ellis, Senior editor and columnist, Kathimerini. A delegation of senior government officials and business leaders from Greece are coming to New York for the 17th Annual Capital Link Invest in Greece Forum organized in cooperation with the New York Stock Exchange and major global investment banks. For further information, contact Eleni Bej, Director of Special Events, at ebej@capitallink.com or call +1 (212) 661-7566. Master of Ceremony – Mr. Athanasios Ellis, Senior editor and columnist, Kathimerini. 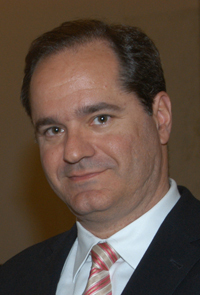 Athanasios Ellis is a columnist for the Greek daily Kathimerini, and a long time US bureau chief, living between New York and Washington. He writes about politics and economics. During his career he has interviewed many Foreign Leaders and Ministers, as well as Heads of International Organizations, among them European Commission Presidents Juncker and Baroso, and IMF Managing Directors Lagarde and Strauss Khan. He has reported from various foreign capitals including Washington (and New York), Bejing, Tokyo, Brussels, Berlin, London, Paris, Rome, Vienna, Jerusalem, Cairo, Ankara and Nicosia. He appears on international media where he analyzes Greece related issues, from national election results and the economic crisis, to the preparation for the 2004 Olympic Games, and relations with neighboring Turkey. He holds a Bachelor's degree from Boston University in Economics and Political Science, and a Master's degree, from BU in International Relations. An event of unique visibility throughout the world. Previous recipients Mr. Andrew N. Liveris, Chairman and Chief Executive Officer of The Dow Chemical Company, in 2012, Mr. John Calamos, Chairman, CEO & Global Co-Chief Investment Officer of Calamos Investments in 2013 and Mr. George Logothetis, Chairman & CEO of Libra Group in 2014.